We are leading manufacturer and supplier of Christmas hanging and other Christmas decorative items in metal like aluminum, iron, steel etc. 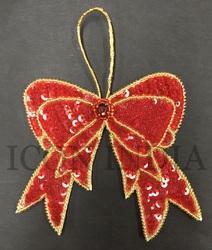 The same design of hanging star is of iron metal with silver plated finish and beads decoration. We are manufacturer and exporter high quality this christmas hanging, decorative christmas hanging, aluminium christmas hanging, beaded christmas hanging. Christmas Hanging Bells made from Paper Mache and Hand Painted by our own artisans. These Paper Mache Hanging Bell are available in 2 different sizes of 2" inches and 3" inches These are very attractive and in high demad during Christmas and New year decorations. 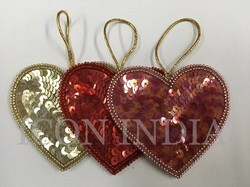 The colors and designs on the bells can be customized as per client requirement. We are a most trusted name among the topmost companies in this business, involved in offering Stained Glass Christmas Decoration Gift. Our range of Christmas Handicrafts are in tune with the joyous & vibrant mood of this festival, coming in attractive color combinations. Handmade Glazed Ceramic specially made for decorative purpose.